Low Volatility — High Returns? It doesn’t seem possible and defies most financial theory. We’ve always learned that higher returns require higher risk. How is it possible to get more from less? But during the past few months there have been two articles that have gotten publicity, Moreira and Muir, Volatility Managed Portfolios (Yale, 2016), and Bilello, The volatility cycle (Proactive Advisor Magazine, May 18, 2016). Price movement during low volatility periods tends to be very orderly. That doesn’t need to be the case. Volatility can be low when investors are just not interested in those stocks or futures markets. Then low volatility would be accompanied by a sideways drift in prices. It turns out to be true for commodities. When the price of corn is below the cost of production, investors and traders lose interest. Farmers don’t want to sell at low prices and, without any expectation of a rally, prices just meander. I would have assumed something similar for equities if it wasn’t for my own experience in portfolio construction. Is the Problem Low Volatility or High Volatility? It can be both, but it’s always at least high volatility. The Bilello article paper shows that the 100 lowest volatility stocks, found in the ETF SPLV, often outperforms the full S&P with much lower risk. It’s not that returns are generally better, but the risk is much lower. The pattern shows that drawdowns are smaller so you are in a better starting place after large market retracements. But using low volatility stocks is not quite the same as just not using high volatility stocks. We’ll explain in the next section. The Moreira and Muir paper shows that high volatility does not have a good payout, that is, you don’t get rewarded for taking more risk. My experience confirms that. But the paper is academic and there is a practical solution that has been circulating in the Futures Industry for at least 20 years. The Royal Bank of Scotland calls their version of it volatility stabilization. In my own work in futures, I’ve found that most of the money is made during periods of low volatility, but only when you leverage up your positions to stabilize the long-term risk. For example, you set your position size in expectation of maintaining a target risk, often about 12%. That means you are willing to have a 16% chance of losing 12% (the left-tail drawdown) over the period of time you used for your calculation. That’s also a 2.5% chance of losing 24% (2 standard deviations). That may be a big loss, but a small probability. When your portfolio volatility drops below 12% (the annualized standard deviation of the rolling returns), you increase your positon size. When it goes over 12%, you reduce your size. This can easily be done in a spreadsheet. When you see the adjusted returns, there is a large increase during the low volatility periods and a small decrease during the high volatility periods. By reducing position size during high volatility, you lose a small amount of return in exchange for a large reduction in risk. So, if you’re willing to give up a little return, you gain all over. The following chart shows a sample Global Macro Futures Portfolio, from 1988, which trades the same markets (about 45) all the time. Without volatility adjusting, the portfolio volatility is about 5%; after volatility adjusting, it is slightly higher than the target volatility of 12%. Adjustments to the positions sizes are made based on a 20-day average true range. Note that the factor is above 1.0 most of the time, indicating that it is increasing leverage. Chart 1. On the left, the initial NAVs are leverage up based on a volatility factor that tries to keep the returns at about 12% annualized volatility. The right shows the variation in the volatility factor from 2010. One method that has been suggested addresses volatility a little differently. In order to decide that volatility is low, we look at a past period and decide if today’s volatility is in the lowest 20%. If so, we leverage up. We need to make some practical assumptions to see if this works, and we’ll use SPY monthly data. We calculate the monthly SPY returns in the usual way, P(t)/P(t-1) – 1, where t is the current month. Choose a rolling period to calculate the volatility. We’ll use 20 months because that seems to be the standard – not too short and still responsive to change. Find the maximum and minimum volatility over the same 20-month period. If this month’s volatility is T or lower, we trade the entire investment. If not, we trade 50% of the investment. We won’t add interest on the remaining 50% because rates are very low. Indeed, emphasizing low volatility returns improves the risk ratio, but at a large cost to the returns. That’s because we are fulling invested only 20% of the time. The remaining investment is idle. Unfortunately, the improvement in the ratio is only modest. Table 1. Comparison of SPY with adjusted returns using a filter threshold of 20% (low vol). Now change the threshold to 75%. That is, trade all of the investment unless the volatility is in the upper 25%. That means we’re eliminating high volatility more than we are emphasizing low volatility. And, we are using more of the investment more of the time. The results are shown below. The adjusted returns are about 0.5% better annualized and the information ratio is 0.35 instead of 0.30. So we get higher returns and lower risk! Just what the doctor ordered. Table 2. 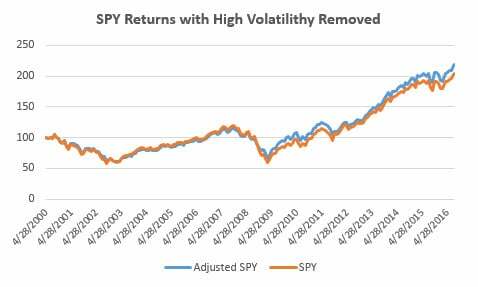 Comparison of SPY with adjusted returns using a filter threshold of 75% (high vol). It doesn’t look like much on a chart, but the adjusted method had a drawdown of 43% in 2008 instead of 51%. We haven’t tortured the data, so a different volatility threshold might yield even better results. Chart 2. SPY with volatility-adjusted SPY, from May 2000. To me, reducing high volatility is a win-win situation. High volatility means high risk, even when it doesn’t show up in a specific case. My experience is that the returns during high-volatility periods don’t come close to justifying the risk. The low volatility scenario is correct about leveraging up, if you can. Returns are lower but more consistent during low volatility intervals, so you might be disappointed unless you can trade a larger position with the same money. That’s easy with futures, but may require a margining arrangement for equities. On the other hand, if you just remove the high volatility, that may not be necessary.